Ownership uncertain, see AL.8. Deposited by Lord Hardinge of Penshurst, 1955. This shield is of large, circular, convex form and is made of grey watered steel with a slightly up turned rim. The surface is chiselled with a broad border of diapered flowers within narrower borders of repeat leaf patterns. The four bosses with pierced flanges are held by the shanks of the hand strap rings and between each of these and the borders are chiselled designs of foliate strapwork. All the chiselled decoration is gilded with a blackened ground. The shield is lined with crimson velvet embroidered with foliate ornament in gold orris thread with a border of gold lace. There is a blue velvet cushion for the hand with crimson velvet covered straps. There is also a belt loop and sling. 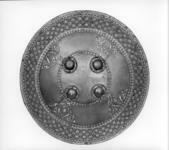 Dimensions: The diameter of the shield is 544 mm. Weight: The weight of the sghield is 2.95 kg.